This is the one Rachel Ray recipe in my repertoire… probably because she hasn’t concocted some silly name for them, as she tends to do. I’ve made a few modifications – adding sundried tomatoes, changing up the seasonings, etc. 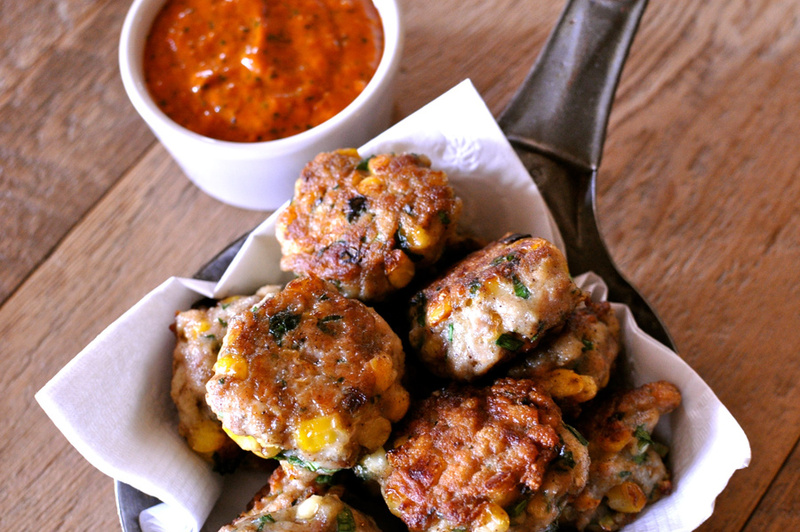 These chicken meatballs are a go to meal when I’ve got chicken that I’m tired on grilling. Serve with pita bread, salads or just dip and enjoy as is. My cheap tip: Make your own ground chicken. I always have chicken breasts in my freezer. Instead of buying ground chicken I but the chicken into cubes and grind in my food processor. Cheaper, easy and just as good. Feel free to substitute ground turkey or pork. In a bowl combine onion and 2 cloves of garlic. Squeeze the water out of the spinach until completely dry. Separate the spinach as you add it to garlic and onion. Add feta, chicken , sundried tomatoes and coriander to the bowl and a liberal drizzle of extra-virgin olive oil. Season with salt and pepper. 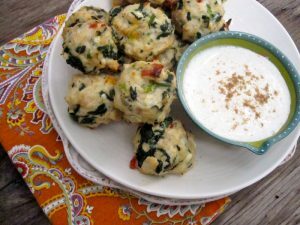 Mix the meat with veggies and feta and form 18 (1 1/2-inch) meatballs. Brush a nonstick cookie sheet with a little olive oil. Place the meatballs on the cookie sheet and bake 10 to 12 minutes until they are golden and juices run clear. Place yogurt, garlic, lemon juice, cumin, coriander and a little salt in food processor and process until smooth. Adjust seasonings and transfer to a serving bowl. Serve meatballs with sauce. Not only is this Thai dish super lean and packed full of flavor… it’s yet another excuse to head to my favorite Asian grocery store: Hong Kong Market. Inside awaits an almost overwhelming selection of any Asian ingredient on your list (and the best selection of frozen potstickers – gyoza – dumplings in Dallas). Fresh lemongrass and thai bird chiles are a must. I would also suggest a better than average fish sauce (Three Crabs Brand Fish Sauce is the best). I store it in the fridge as I use it often for Vietnamese Bun and it lasts forever. Central Market also has these ingredients… but for 3 times the price. So be adventurous and check out the Asian markets. This recipe is adapted from Giada’s Turkey Larb. 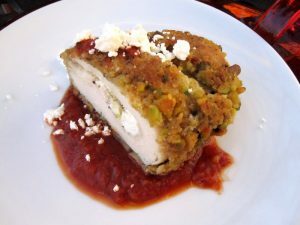 You can use any ground meat for this dish but the chicken breast is great & stays very moist with the onions. She also calls for mint… I prefer cilantro and Thai basil in the dish. Dressing: In a small bowl, whisk together the lime juice, lemon juice, fish sauce and honey. Set aside. 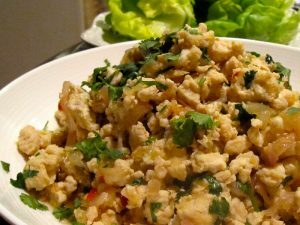 Larb: In a large skillet, heat the oil over medium heat. Add the onion, shallots, lemongrass, chile, and salt, to taste. Cook until the vegetables begin to soften, about 5 minutes. Add the chicken and season with salt. Cook, stirring frequently, until the meat and vegetables are cooked through, about 5 minutes. Add the dressing to the pan and cook for 2 minutes. Remove the pan from the heat and stir in the cilantro. Season with salt and pepper, to taste. Spoon the chicken mixture onto the lettuce leaves and arrange on a serving platter. Serve with sticky rice or steamed white rice if desired. Any restaurant that begins a meal with cornichons, dijon mustard & bread is made for me. 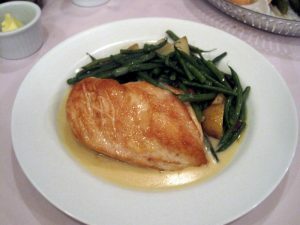 L’Express is a well-known Parisian-style bistro and needs no introductions for lucky Montréalers. It’s been nearly a year since I stumbled upon this gem. If you aren’t looking for it… you will stroll right by without noticing the only marking of its location: its name spelled subtly in white tiles on the sidewalk. I’ve dined here on every trip to Montréal… and I will be back for round 3 this summer. My first experience was a gorgeous lobster risotto. This last trip I chose a chicken with mustard sauce. 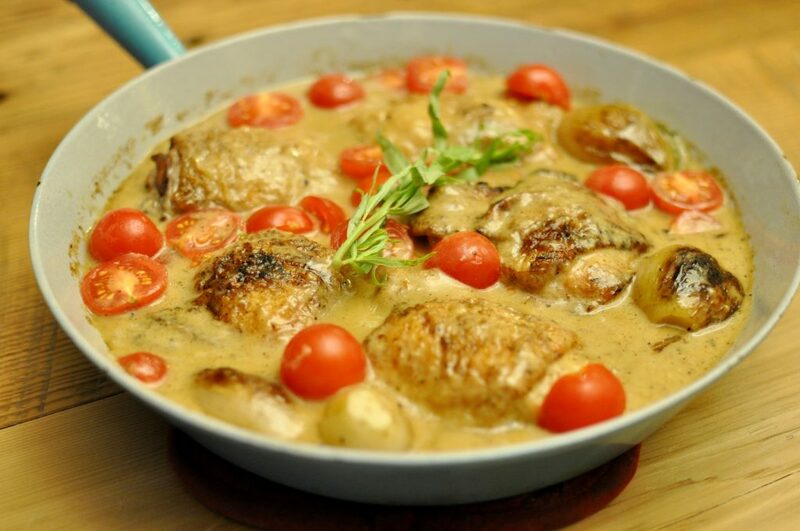 I could go on for quite sometime about the perfect sauce… rich and creamy with the perfect amount of lemon. However, I was equally impressed with the preparation of the vegetables: a melee of haricots verts, potatoes, cherry tomatoes and French black olives. L’Express… I miss you. You are hands down my favorite place to enjoy a meal in Montréal. I love that your plates lack fancy garnishes and are full of only beautifully classic and simple French food. I will see you soon. Season chicken on both sides with salt and pepper. Coat an oven safe skillet with a little olive oil and place over med/hi heat until hot. Add chicken skin side down and cook for 3 minutes per side (ending with skin side up). 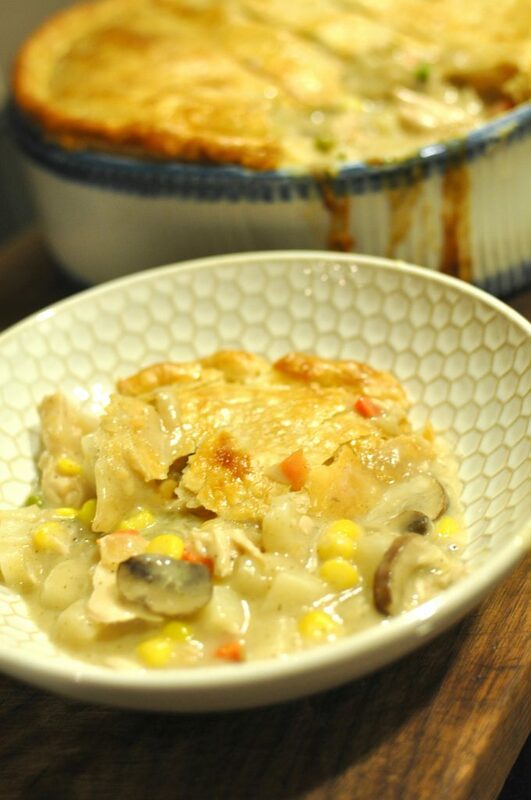 Place skillet in oven and bake for 20 minutes. Remove chicken from skillet and set aside to keep warm. Drain most of the chicken fat from the skillet. Add the butter, shallot and garlic. Season with salt & pepper and saute until translucent. Add wine or broth to skillet, deglaze by scraping particles that cling to bottom. Combine flour and 1/2 cup cream, stirring until smooth; add to skillet. Stir in mustard. Cook over medium heat, stirring constantly, until thickened. 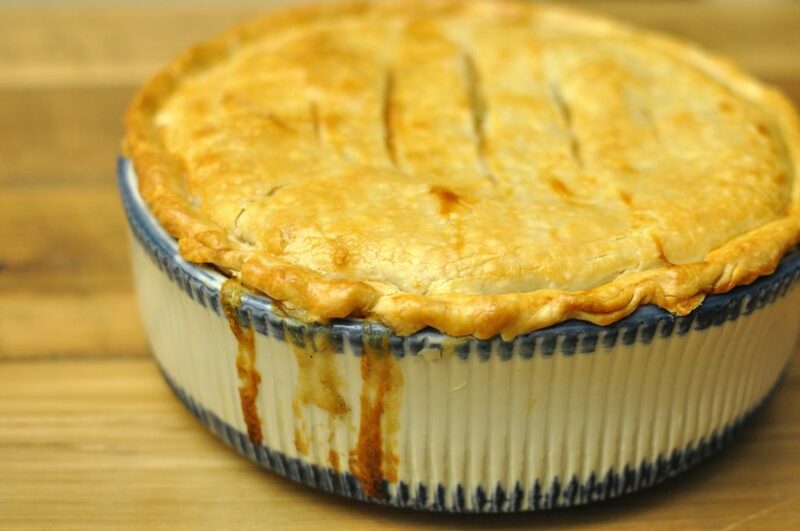 Pork and apples are a classic combination. I eat most of my apples with cheese and honestly getting a nice texture from a cooked apple can be tricky. So apple cider is a welcome ingredient already full of flavor from the allspice, cinnamon and cloves. A few months ago I made a version of this pork recipe with my Acorn Squash and Sweet Potato Ravioli. I had boneless center cut chops brined overnight in apple cider and peppercorns. 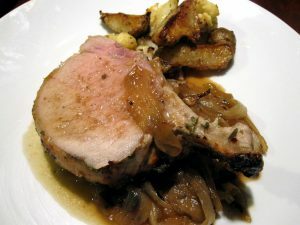 This time a 6-chop pork loin roast was in the freezer begging to free up some space. Since it was on the bone I did not brine the meat but if you have a boneless tenderloin or chops I would suggest brining for a few hours to overnight. I’ve given instructions below on how to prepare this with pork chops and skip the roasting part all together. 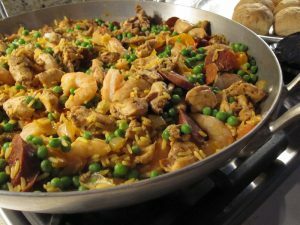 This was very simple to prepare and the payoff is much larger than the effort. I served with roasted cauliflower and Jerusalem artichokes (also called sunchokes). In a food processor, combine the chopped herbs with the garlic, crushed red pepper, a generous pinch of salt and enough olive oil to make a paste. Rub the paste on the outside of the pork rib roast. Toss the onions with olive oil, and salt, and place in the bottom of a roasting pan or large oven proof skillet. Add the thyme, bay leaves and 2/3 of the cider. Place the pork on top of the onions and place in the preheated oven. Roast the pork at 425 degrees F for 20 to 25 minutes or until the pork has developed a brown crust. Lower the oven to 375 degrees F and roast for another 30 to 35 minutes or until an instant-read thermometer reads 150 degrees F. If the crust on the pork starts to get too dark, cover it with foil. Remove pork from oven and transfer to a platter and cover to keep warm. Place pan with onions and cider on burner over medium-high heat. Add remaining apple cider & chicken stock to the pan and bring to a simmer. Reduce until sauce has thickened, about 15 minutes. Stir in whole grain mustard and butter to finish sauce. Cut the loin into chops & serve with the cider mustard sauce. Rub the paste on the outside of the pork chops and set aside. Preheat skillet over medium high heat and add 1 tbsp olive oil to the pan. When hot, add chops to the pan and brown on both sides until a nice crust forms. Remove chops from pan and set aside. In the same pan add onions or shallots and cook until translucent and soft. Deglaze the pan with apple cider scraping the brown bits off the bottom on the pan. Add chicken stock and bring to a simmer. Reduce until sauce has thickened, about 15 minutes. Stir in whole grain mustard and butter to finish sauce. Place pork chops back in the pan to heat through in the sauce. Toss artichokes and cauliflower in olive oil, season with salt & pepper and toss in oven proof skillet. Roast for 20 minutes or until tender. Remove pan from oven and add 2 tablespoons butter and herbs. Toss to combine. Serve warm. My good friend and fellow foodie, Catherine of Fish and Veggies, peaked my interest in this dish. She gave it a try and received rave reviews. So I followed her lead with a few modifications based on her suggestions and made my own Pork Pernil. “Pernil” is a classic Puerto Rican pork roast that is incredibly easy and equally impressive. The basic method is making the “adobo” which is simply a purée of garlic, herbs and citrus juice. Next time I will add onion and chili powder to the adobo for a little more flavor. It couldn’t be simpler. Throw the potatoes in the bottom and after 3 hours they are perfectly crispy and flavored with the adobo. I made a quick coleslaw and served with flour tortillas to make tacos. Prepare the adobo: In a food processor, add the garlic, oregano, cilantro, cumin, salt, and pepper. Add lime juice and orange juice. Drizzle in olive oil and pulse until you have a nice puree. Using a sharp knife, score the surface of the meat with small slits. Place pork in a large plastic bag. Pour the marinade all over the pork and seal plastic bag. Marinade in the refrigerator for at least 3 hours or overnight. 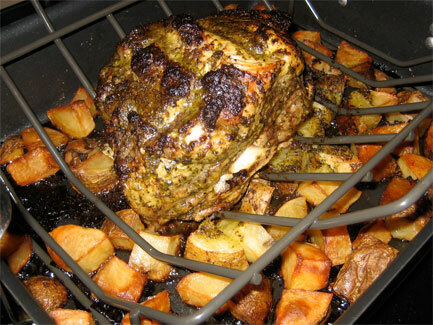 Cut potatoes into 1-inch cubes and place in the bottom of a roasting pan. Remove pork from marinade and place the pork, fat side up, in a roasting pan fitted with a rack insert. Rub leftover marinade on top of pork – being sure to get into the incisions so the salt can penetrate the meat and pull out the moisture – this will help form a crust on the outside when cooked. Roast the pork and potatoes for 3 hours, uncovered, until the skin is crispy-brown. Let the meat rest on a cutting board for 10 minutes before slicing, covered lightly with aluminum foil. Drizzle with lime juice and garnish with cilantro. Mix all ingredients for the coleslaw dressing and add to coleslaw mix 5 minutes before serving. Serve with tortillas for taco making!